Carson Wentz has 29 fumbles in 34 games. Carson Wentz is a top five quarterback in the NFL. He has everything. He has a powerful arm, his accuracy has improved greatly since he entered the NFL, he has impressive mobility, he has great size, he's smart, he's competitive, he's mature, he's a leader, and he's tough. There's not a lot to dislike. But, if we're going to nitpick, as we do here, Wentz's isn't completely without his issues. Earlier this week, we pointed out that Wentz has had nine game winning drive opportunities, and has only won one of those games. For the record, for all the reasons noted above on what makes him great, the thinking here is that those game winning drive opportunities will eventually turn into wins. The other significant issue with Wentz is that he has 29 fumbles in 34 career games. That's a lot. #Analysis. Because quarterbacks are often credited with fumbles that aren't always necessarily their fault, I thought it would be useful to take a peek back at all 29 to see what they looked like. As you can see, a fair amount of the fumbles are due to bad snaps. Obviously, those aren't his fault. Some were mishandled hand-offs, but they seem to have (mostly) been a rookie year thing. Some occurred when Wentz had bodies around him in the pocket, and he wound up to throw as if the pocket wasn't collapsing around him. If I'm a defensive line coach playing the Eagles, I'm making sure my players' hands are constantly reaching for the football, as Wentz might wind up into them and jar the ball free on his own. And finally, the double-edged sword. 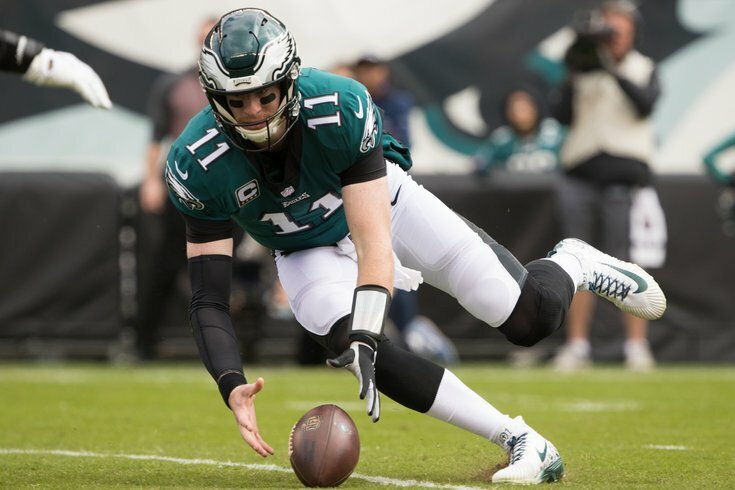 When Wentz tries to extend plays, he'll often do so with spectacular results. Of course, sometimes things go wrong when a normal play turns into schoolyard ball. So I think that on those, you almost kind of have to live with the bad as long as there's significantly more good.